He’s baaaaaaaack — Anti-Semite George Galloway wins MP seat. 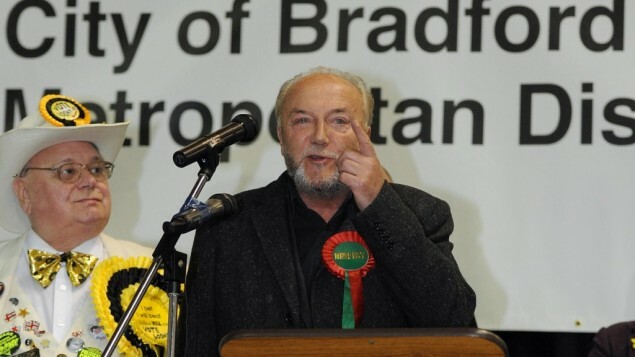 West Bradford – a majority Muslim area – has elected a total p.o.s. of a human being to represent them in The House Of Commons. Galloway has long been a bitter critic of Israel. He accepted an honorary Palestinian passport from Hamas prime minister Ismail Haniyeh three years ago — after organizing aid trips to Gaza. He has reportedly described Jerusalem and Baghdad as being “raped” by “foreigners,” claimed Zionists control the British media, and blamed Israel for the assassination of Lebanese prime minister Rafiq al-Hariri. In 2010, Galloway was denied entry to Canada on national security grounds over his links to Hamas, though he was later permitted to visit. Galloway also has courted controversy over his links to former Iraqi leader Saddam Hussein and was suspended from the House of Commons for 18 days in 2007 after he was accused of concealing his financial dealings with Hussein’s government. An investigation found that a charity Galloway set up had been partly funded by the Iraqi dictator. The peace-loving scum like this guy so much, they elected him over one of their own. What remains of the once mighty and proud United Kingdom dies a bit more each passing hour. This entry was posted on Friday, March 30th, 2012 at 12:25 and is filed under Main Postings, The Second Amendment To The Constitution Of The United States..	You can follow any responses to this entry through the RSS 2.0 feed. You can leave a response, or trackback from your own site.